Steve Smith and Brad Haddin have come to the rescue for Australia on day one of the fifth Test in Sydney. STEVE Smith and Brad Haddin kept Australia on target for a 5-0 Ashes whitewash, after coming to the rescue on day one of the fifth Test in Sydney. Bowled out for 326, electric man-of-the-series Mitchell Johnson ensured Australia went to stumps on a high when he removed Michael Carberry in a thrilling climax to leave England 1-8 in reply. After England won their first toss of the series, Australia were sent into bat and were in trouble when Smith and Haddin came to the crease with the home side reeling at 5-97. But the pair put on a crucial 128-run sixth wicket stand which instigated a stunning turnaround, despite England allrounder Ben Stokes claiming career-best figures of 6-99. It gave England a nerve-racking six overs to face before close and once again Johnson (1-3) delivered, with Nathan Lyon taking a superb diving catch at leg slip. The day’s play followed an all-too-familiar theme for the series, with England letting Australia off the hook and Johnson making them pay. 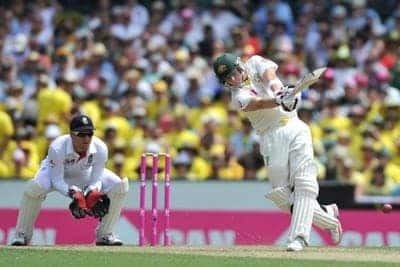 Earlier, Smith’s 115 was his second century of the summer, and Haddin’s 75 made him the first batsman in over 40 years to score a half century in every match of an Ashes series. The pressure is firmly on England given their struggling batting order has managed just two totals greater than 300 this series. Smith was the final wicket to fall, bringing an end to a fighting innings where he smashed 17 fours and a six. Haddin was just as brutal, belting 13 boundaries in his knock of 75. The veteran wicket-keeper has now scored four half centuries and a ton from every first innings he’s played this series and is in the form of his career. England’s hopes of stopping Australia record the third 5-0 whitewash in Ashes history were hampered further by a hamstring injury for fast bowler Boyd Rankin, one of three debutants for the tourists. Rankin went off just one ball into his second spell, and remarkably attempted a comeback only to break down again. Australian openers David Warner and Chris Rogers went cheaply, and Michael Clarke and Shane Watson followed before lunch – with Stokes, Stuart Broad and James Anderson sharing the spoils. Selectors gave George Bailey another chance at No.6, ensuring this Australia side goes down in history as the first to field an unchanged XI through a five-match series. However, the romanticism couldn’t inspire Bailey and his spot is now in jeopardy after edging Broad for 1.